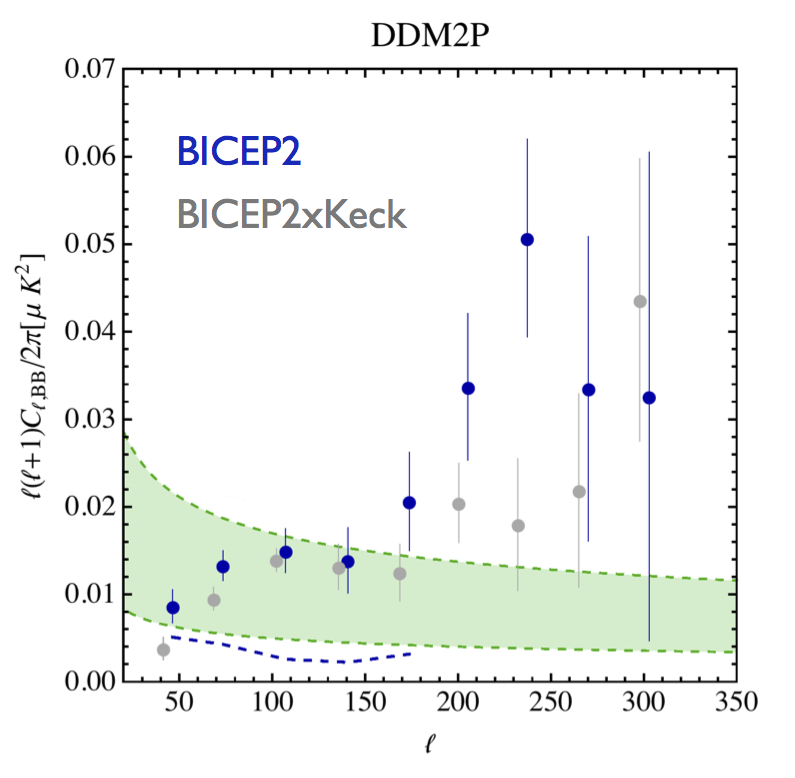 I think the DDM2P is not a "CIB-corrected" version of the BICEP map extracted from the Planck polarization fraction plot (what BICEP called DDM2). Rather, in DDM2P Raphael constructs a new polarization fraction of his own from the Planck Q and U polarization maps, and uses T from public Planck data to get the rest of the denominator. Then that polarization fraction is input into a foreground analysis analogous to BICEP's DDM2 (which uses Planck dust map models, etc.). It doesn't have the CIB contamination but it's *not* a CIB-subtracted version of the original Planck polarization fraction plot. (The third plot, also confusingly labeled with Q/U, is an attempt to construct the whole dust foreground from the Q and U maps directly, using a procedure entirely different from BICEP.). As far as I'm aware, there is no actual demonstration that the BICEP foreground line came from the CIB-contaminated Planck polarization fraction, or what would happen if CIB were "subtracted" from that polarization fraction and the analysis repeated. So the commentary is not directly about the BICEP analysis itself. But the title of that slide (no.38) is "CIB corrected foreground models"... The input that goes into DDM2P is listed on the previous slide. I agree it's definitely not just CIB subtraction of Bernard's plot. But my understanding is that this additional information allows him, in particular, to subtract CIB and get the pure dust polarization fraction (though it may be too naive). Sure thing, the DDM2P is not CIB contaminated by construction. So it's a bit of a pedantic distinction, but my take-home from this route is that caution is advised since it's sort of an apples-to-quinces comparison -- if it were really a CIB-subtracted version of the BICEP foreground analysis, then more dire conclusions would be warranted. We haven't established that BICEP actually used a CIB-contaminated map for their foreground, or that corrections to that hypothetical map are what's shown in the plots. I'm not an expert, but to me the fact that the signal drops for l<100 somewhat points to an interpretation in terms of primordial B-modes. I thought your rumours a few days ago were a bit over the top; having seen these slides I guess I'm now a bit closer to your opinion. Regarding the CIB subtraction, my understanding is that Flauger has created his own version of the Bernard map using the Q, U and T data also taken from digitized slides, but with CIB subtracted, and then used this to get the DDM2P model, but that the conclusions from this don't match the conclusions from the DDM2 model used by BICEP. The indirect inference is that BICEP didn't do the CIB subtraction correctly - though perhaps there are other reasons for the difference? A revised value of (the tensor to scalar ratio) r that is a factor ~2-4 below 0.16 would mean significant deviation(s)from the textbook quadratic inflation model. Assuming the scalar spectral index remains close to 0.96, a value preferred by WMAP and Planck, we could hope in this case to gain some insights concerning the inflaton coupling to other fields. Raphael did a wonderful job describing the issues. People wanted to focus on the distance of the points from the foreground uncertainty band, but in my mind what throws the BICEP2 results to the garbage is that the shape of measurements and that of the foreground are impressively correlated. I hope there is some accountability for what these guys did. It is a disfavor to the scientific community working away from huge press releases. But many have probably negotiated big positions at other universities. Sad state of affairs. "but in my mind what throws the BICEP2 results to the garbage is that the shape of measurements and that of the foreground are impressively correlated." What do you mean? All the cross-correlations that have been calculated between the B2 results and different foreground models, including DDM2 (irrespective of CIB subtraction) have shown very small correlation. You can argue about whether that is significant, but if anything the cross-correlations are in B2's favor. I'm not an expert in the field so I may pretty much be wrong about it. But if I understood the talk correctly - and am reading the plot correctly - the foreground may lie anywhere in the shaded region, but cannot have any shape within the shaded region. For any given zero level it is just a line. And for any selected zero level, BICEP2 measurements still deviate significantly from that shape. “Complete nonsense” argues Mukhanov. "The journals are full of this but it remains nonsense." Mukhanov says that should leave the spectral index alone if you do not want to start a fight with him." So much for the russian position on the Biceps2 results. No. It's a surprisingly disappointing paper from people who should know better. They do a simple LCDM+r model with dust as the only additional parameter, never mind any extra parameter to relieve tension. Then they set a pessimistically flat prior that overweights low-ell TT in the analysis, so all of BICEP2 BB is dust more or less by assumption. BICEP2 saw something in certain patch of sky. Planck's can't tell how much there is dust and how much instrumental error. Nobody knows with any certainty how much there is dust to compare with BICEP2. Until somebody knows how much there is dust, nobody will know for certain whether BICEP2 is right or wrong. Am I missing anything? Rastus, thanks, that looks interesting for the r=0 fans.